Dr. Jonas Salk, a medical researcher who pioneered the first successful polio vaccine, said that’s one of the most important questions people can ask themselves on a regular basis. Every choice, he said, no matter how small or how large, has consequences for future generations. If that’s one of life’s most important questions, parishioners at Sacred Heart-St. Joseph Parish in Topeka can answer affirmatively. 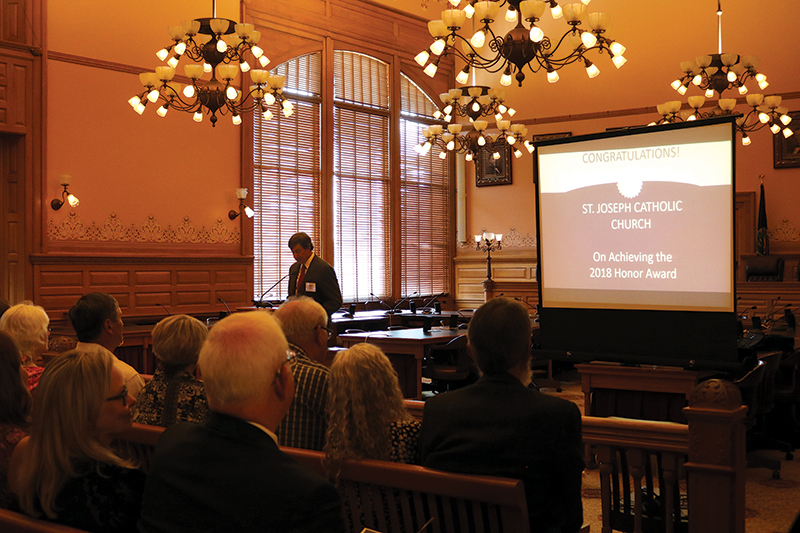 In fact, their recent generous and enthusiastic response to a multimillion dollar restoration project for St. Joseph Church led to an unexpected award. The award, one of 10 given by the alliance, was presented to the church in recognition of the major exterior restoration project recently completed, which included everything from repointing all of the church’s mortar, cleaning and patching the brick and limestone, and the addition of gold leaf to the crosses on top of the church’s spires, to the installation of period-appropriate lighting for all exits, and the restoration or replication of many original elements like the hardware, window frames and glass patterns. On hand to accept the award were representatives from the parish and the dozen or so contracting firms associated with the work, including SFS Architecture. The architectural firm nominated the project for the award by submitting an application of more than 30 pages detailing the various phases of the project, supplying before-and-after photos and summarizing the church’s historical significance. The award surprised Father Tim Haberkorn, the parish pastor. Due to scheduling conflicts, he was unable to attend the awards ceremony, but expressed his thoughts in a recent interview. Decades from now, lifetime parishioner and finance council member Mark Burghart said he hopes his descendants will appreciate the sacrifices he and his fellow parishioners are making now to restore the church to its splendor, just as he appreciates the sacrifices made by the parish’s earliest families. As a tax attorney, Burghart assisted the church with his expertise. But he was only one of the many who offered their time, talent and treasure to help the church complete its restoration work. He specifically praised Teresa Thomas, parish secretary and chair of the restoration committee, for her role in the project. “When we began in 2014,” said Thomas with a smile, “we were talking about restoring the interior of our church and made the mistake of asking Shawn [McGarity, a member of the board of the Kansas Preservation Alliance,] to check out our structural integrity. “We have had contributions not only from the state but from literally thousands of individuals across the whole country — former parishioners, people interested in history, people interested in architecture — and we want to thank each and every one,” she added. St.Joseph’s in Topeka should be the pride and joy of the entire archdiocese. Amen.